This collection of German sacred music from the 17th and 18th centuries is taken from Ricercar's own catalogue, with two exceptions. Buxtehude's Membra Jesu nostri was first released by the French label K617 and Bach's St John Passion and his Cantata BWV 4 are live recordings from 2003 and 1995 respectively which seem not to have made it to CD before. Obviously this set only includes a very small selection from the huge repertoire written in Germany at the time. Passiontide was an especially important part of the ecclesiastical year and I am pretty sure that in Germany more music for this time of the year was written than in any other part of Europe. All the works in this set are from the Lutheran part of Germany, and that has everything to do with the great significance of Jesus' Passion in Martin Luther's theology, often labelled as 'theology of the Cross'. However, the music in this collection is not strictly connected to the Passion and resurrection of Christ. Some pieces were written for funerals, such as the cantatas by Telemann, Riedel and Boxberg and Bach's famous Actus Tragicus. A chorale like Ach Herr, laß deine lieben Engelein is also not specifically connected to the Passion of Christ, but is associated with it because Bach used it as the closing chorale in his St John Passion. There are also pieces in which man expresses his awareness of his sins and his longing for death, such as the anonymous sacred concerto Es ist g'nug. One could consider this feature one of this production's strengths, especially because these pieces are of superior quality and very expressive. In fact, I suspect that most people seeing the title of this set will expect specifically music for Passiontide, and they could be in for a disappointment. There will also be music-lovers who already have several of these pieces in their collection. It is a shame that the booklet omits a list of the original releases from which the various pieces were taken. They would probably like to have the recording of Bach's St John Passion, but that is not available separately. If you are interested in this kind of music you would be well advised to look for the original releases anyway; probably many of them are still available. These also include the lyrics which are omitted from this production - a factor that seriously reduces its value. In this review I can't discuss every single piece, so I concentrate on the main items. Among these are the Historia der Auferstehung Jesu Christi by Heinrich Schütz and his Die sieben Worte Jesu Christi. When he was appointed Kapellmeister at the court in Dresden in 1617 every year the gospel of Easter was performed in a version by Antonio Scandello (1517 - 1580), one of his predecessors in Dresden. It was only in 1623 that Schütz composed his own setting, the Auferstehungshistorie, as a replacement for the Scandello. This was his first contribution to the genre of the Historia. It linked up with tradition, but also contained some significant innovations. Schütz used the same text as Scandello, a compilation of the events of Easter from the four gospels, the so-called Evangelien-Harmonie (Harmony of the Gospels), by the Wittenberg reformer Johannes Bugenhagen (1485 - 1558). He also kept the traditional recitation model, the Easter tone, for the part of the Evangelist. Scandello had set the parts of the individual characters - Jesus, Mary Magdalene and Cleophas - for up to four voices while in Schütz's Historia they are set for two, with the exception of the part of Cleophas, which is given to a soloist. Schütz gave performers the option of assigning the second part to an instrument or omitting it altogether but in most performances these parts are sung by two voices and that is also the case here. The Ricercar Consort delivers a very fine performance of great stylistic coherence. Mark Padmore is an excellent Evangelist. The Sieben Worte were composed much later, in 1645. It begins and ends with a tutti section, called Introitus and Conclusio respectively. These use the first and the last stanzas from the hymn Da Jesus an dem Kreuze stund, but not the traditional hymn melody. Schütz rather set them as five-part motets. The heart of the piece - embraced by instrumental sinfonias - is to be found in the seven words which Jesus spoke from the Cross, taken from the four gospels. The words of Jesus are sung by a tenor, the narration of the Evangelist is allocated to a single voice - soprano, alto or tenor - or set for four voices. The third major work is the St Matthew Passion by Johann Sebastiani. Not much is known about him but it is presumed that he studied in Italy. He was Kantor at the cathedral of Königsberg (now Kaliningrad) and was later appointed Kapellmeister by the Elector of Brandenburg. This Passion is his best-known work. The Evangelist and the various characters are supported by a consort of viols, whereas the words of Christ are accompanied by two violins. Sebastiani's Passion is the first in which chorales are included, providing a kind of unity within the work. These are all set for soprano and instruments. The core of the piece is not the dramatic character of the events, but rather the text, in the tradition of Schütz. The recording dates from 1995 but is still well worth listening to. The performance is very respectable, although I could imagine a more declamatory account of the Evangelist's part, sung here by Hervé Lamy. Greta De Reyghere sings the chorales, and does so quite well, but here a sharper articulation and more dynamic shading would have been welcome. As far as I know no other recording of this Passion is available. The inclusion of the items mentioned so far can be easily justified by the fact that they are not that well-known, although the two works by Schütz are available in several other recordings. As Buxtehude's Membra Jesu nostri is one of the most frequently-performed and recorded works for Passiontide its selection for this set is more questionable. Those who love this kind of music certainly have one or more recordings in their collection. The editors probably thought that it could not be omitted as it represents a different approach to the Passion of Christ. The text is a combination of verses from the Bible and extracts from Rhythmica Oratio, a collection of hymns which address the parts of the body of Christ hanging on the cross. It is rooted in medieval mysticism and is far away from the 'objectivity' of the Passion music by Schütz and Sebastiani. Unfortunately the editors have chosen a performance which is at odds with its very character. The Membra is a contemplative work, but Benoît Haller has opted for a more dramatic, Italian-influenced interpretation. This is reflected in strong contrasts in tempi, an abundant application of ornamentation and a differentiation in the scoring of the basso continuo, including harpsichord and harp. The tempi are often unsatisfying, sometimes too slow, and too fast on other occasions. Now and then a singer has problems with the tessitura of his part, and there is also too much vibrato in some of the voices. The Latin text is wrongly pronounced the Italian way. There are more satisfying performances available. 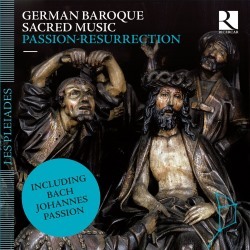 The fact that Bach's St John's Passion is included here in a live performance means that one cannot expect technical perfection; not that the recording is completely satisfactory either. It seems that after about 15 minutes the volume has been diminished and the miking changed. Even so, this performance has some fine aspects which makes it one of the better versions available. One of its assets is Hans Jörg Mammel who gives an excellent account of the part of the Evangelist, although I find the tempi sometimes a bit on the slow side. I would also have liked more rhythmic freedom. Mammel also sings the arias, and here he is even better. Rarely have I heard a more incisive performance of the aria 'Ach, mein Sinn'. Caroline Weynants delivers fine interpretations of the two soprano arias. I am not so sure about the way the tremolo on the word "tot" is interpreted. It seems that Bach refers here to the practice of using tremolos in 17th-century string music, an expression of extreme emotion which would perfectly suit the text. The alto arias are disappointing: the mezzo-soprano Laurence Renson has a nice voice and sings well, but her interpretations lack expression and are rather bland. The balance with the ensemble in 'Von den Stricken' is less than ideal. The bass parts are a bit uneven. Philippe Favette's voice is too light-weight for the role of Jesus and his performance lacks authority. Benoît Giaux does better in the role of Pilate. It is not quite clear who sings the arias - the booklet leaves us in the dark - but it doesn't really matter, because neither of the bass solos comes off really well. The choir is generally good in the turbae, although some are a shade too slow. 'Wir haben ein Gesetz' and 'Lässest du diesen los" are not fiery enough. The chorales are not bad, but should have received sharper articulation and stronger dynamic accents. One of the most impressive parts is the opening chorus, which has just the right tempo. The majesty of God which the text refers to comes perfectly off here, in contrast to the recent recording by Richard Egarr whose tempo is ridiculously fast which results in this chorus losing its impact. The smaller pieces and the cantatas by Telemann, Riedel and Boxberg are well worth exploring if you don't know them already. This is German baroque at its best, and the performances are generally very good, some minor points of criticism notwithstanding. Those who have little of the music on offer here in their collection should take this production into consideration. It is a great way to become acquainted with what is typical of German sacred music of the 17th and early 18th centuries. There is a good chance it will make you want more of it. I strongly advise further investigation of the Ricercar Consort's recordings of this kind of repertoire which are among the best available.